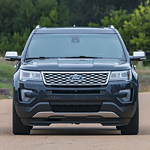 Blog Post List | Robberson Ford Sales Inc.
Buying a new vehicle can be very expensive today, which is why so many consumers are now choosing to buy used vehicles. However, buying a good, reliable used vehicle can often be a difficult task. The Ford Certified Pre-Owned Program takes out a lot of difficulties. If you’d like to know more, stop at Robberson Ford Sales Inc and speak to one of our many sales representatives. 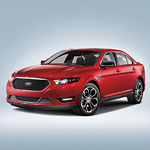 The Ford Taurus is a popular full-size sedan, thanks to its stylish exterior and interior. However, you'll spend most of your time inside the vehicle, so it's important that it's well-designed. Upon sitting in the car, you'll immediately feel the cozy seats and spot the cloth-wrapped front, center and rear pillars. Ford utilizes an elegant color palette and sleek, clean lines for a captivating look. Furthermore, the installed insulation provides a quiet ride and lets you enjoy a conversation or your favorite tunes. While it is great to have a vehicle that looks good, other things to look for in a vehicle include a great sound system. 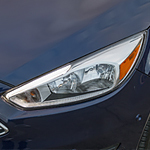 The Ford Focus is one of the vehicles that has different sedans that are going to have some of the best in design, performance and sound. The Ford Transit Passenger Wagon is a large passenger vehicle that can take you and your group wherever you want to go. While you travel around Bend, you'll be able to stay safe and entertained, and you can stay comfortable at the same time. Finding a three-row SUV is important to you as you need that kind of space for your family and your friends. You do not want to give up the features that you love in order to get space, though. With the popular Explorer, you receive a three-row Ford SUV and also all of the technology that you want to find in a vehicle. The Super Duty by Ford is a leading heavy-duty truck. It's a great choice if you need something that can withstand a variety of conditions and handle any type of task. 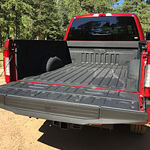 The truck is made out of durable materials that give it rigidity. The body was built using military-grade aluminum-alloy that's dent- and ding-resistant, and the fully boxed frame consists of high-strength steel and is reinforced by up to 10 crossmembers. These materials are also relatively lightweight, and they work together to help the truck achieve best-in-class payload and tow ratings. 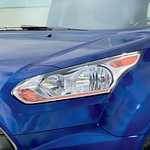 In the popular compact SUV class, the Ford Escape tops the list for its expert mix of performance and interior design. 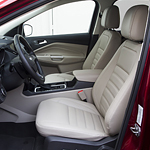 Ford engineered the Escape with plenty of thoughtful options to make your time traveling more relaxing and enjoyable. The cabin of the Escape is lighter and brighter thanks to a large sunroof that offers panoramic views to both front and back seat passengers. On cold winter days, the heated steering wheel will keep your hands warm. Its ergonomic design makes it easier to grip no matter the season. 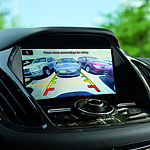 Look into the Smart Ford C-MAX at Robberson Ford Sales Inc.
Are you trying to find a hybrid that is popular and a vehicle with smart features? The Ford C-MAX is set up with a number of great features and it is a popular pick among people like you who are looking for a compact hybrid.